In Monty Python’s Life of Brian (1979), the title character, who accidentally becomes a rebel against the occupation of Judea, gets an assignment to write the message "Romans, go home" on the wall of Pontius Pilate’s palace. Just as Brian is frantically completing the graffiti, along comes a Roman centurion. Instead of focusing on the content of the message, he is shocked by its grammatical errors and forces Brian to write the correct line one hundred times: "Romani ite domum". The centurion may have been a bit too preoccupied with spelling to notice the political message, but in reality, the rebellious and protest function of graffiti rarely goes unnoticed (as we saw last year in Zagreb, when the municipal officers promptly removed the rainbow drawn on the sidewalk in front of the Croatian Bishops' Conference). Since their introduction more than half a century ago, graffiti have served as a means of expressing discontent and resistance to the dominant culture and society, and are usually an integral part of social unrests and revolutions. Graffiti and posters were used, for example, during the student and worker revolts in Paris in 1968; the Nicaraguan revolution of 1979; in the fight against apartheid in Botswana in the late 1970s; or, more recently, during and after the 2011 revolution in Egypt and in response to the economic crisis in Greece. It is no wonder that oppressed, marginalized and dissatisfied people - who usually have no access to the media, especially in times of crisis - resort to this method of expressing their opinions, since it is cheap, easy and available to everyone (we could even call graffiti "the most democratic medium"). Also, seeing that they appear in public spaces, graffiti have great visibility and serve as a tool of creating spaces of democracy. However, in popular consciousness the idea of graffiti is inseparable from negative connotations, and they are mostly perceived as a form of vandalism and destruction or as a defacement of the public space. Zagreb has battled with graffiti artists for years, and newspaper articles often cite a research by the Institute for Tourism according to which two thirds of foreigners highlight graffiti as one of the city’s greatest flaws. This "urban scourge" that is driving away our tourists is regulated by the Penal Code (art. 235), as well as the Decision on communal order of the City of Zagreb. It states that it is forbidden to destroy building façades, but also public clocks, public toilets, public wells, fountains, telephone boxes and other communal facilities and devices used by the public, as well as to write messages and announcements on them, to draw, scribble, and in any other way dirty or deform them (Art. 4; 24; 69). There is also the Strategy of urban security of the City of Zagreb 2014 - 2017, where graffiti are explicitly defined as "a reflection of vandalism", and let us not forget the Action plan to prevent vandal graffiti adopted last year, which presents graffiti as a problem for the city’s hygiene. Apparently, the graffiti are "increasingly spreading and creating the impression of City of Zagreb’s untidiness and neglect", like some kind of infection, and "are destroying and defacing property, reducing its value, negatively affecting the attractiveness of Zagreb as a tourist destination and encouraging deviant behaviour among adolescents." At the same time, despite these negative associations, graffiti are increasingly often perceived as a form of artistic expression that can positively contribute to a city’s urban identity and creative landscape. This shift occurred in the 2000s and 2010s, with the advent of festivals dedicated to street art, which allowed artists to (legally) intervene in the public space and their work to be recognized as enriching rather than damaging the cultural image of the local community. In the past couple of years, similar festivals have sprung up in Croatia, attracting numerous domestic and foreign artists who use them to build their distinctive style, share experiences and show that not every writing on communal buildings has to be "vandalism". Street Art Museum, OHOHO Festival, Nema labavo in Split, Street Art Festival Poreč, Boombarstick in Vodnjan and Indierekt in Umag are just some of these, and in July Zagreb hosted two events which aimed to provide space for artistic intervention and to revitalize neglected urban spaces, simultaneously creating new places of sociability. It should be noted that street art in Croatia is associated with the intention of reviving neglected or unused sites (Badel, Paromlin, the distillery of the oil refinery in Branimirova Street, the old military hospital in Vlaška Street, Gredelj, the slaughterhouse in Heinzelova Street, etc. ), which is also in line with years-long efforts of the independent scene to call attention to the problem of neglect and decay of urban spaces, but also the lack of space for their own activities. The first of these two events was Art Park, organized by PIMP MY PUMP and Lapo Lapo Studio, which took place this summer in the so-called "Junkie park" (between Tomićeva Strret, Ilica Street and Strossmayer Promenade) with the intention of activating and re-evaluating this neglected space in the very centre of the city. 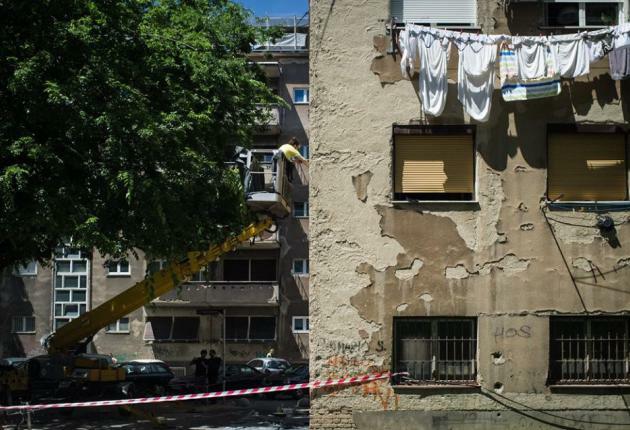 The second event was painting a wall at Vojnovićeva Street 19 as part of the Zagreb: Open City campaign, held in cooperation with the Design District Zagreb festival. Apart from the visual interventions - painting the walls - both events involved thematic workshops, music programs and, most importantly, the comingling of participants, residents and all interested parties. In this text, I will focus on the mural in Vojnovićeva Street created by Miron Milić (whom we might call our established muralist), because the campaign that sparked its creation can tell us something about the function of art in the public space, about the power relations at work there and about creating spaces of togetherness. But for starters, let us briefly look at the terminology, i.e. the difference between graffiti and street art. There is no consensus as to where the boundary between these two forms lies (but this is, always, the result of problems arising from the very idea of the genre, rather than specific characteristics and differences). However, some examples should be noted to help us more easily understand the context of the creation and reception of these works. Since I don’t know enough about the graffiti scene or the history of graffiti, I won’t discuss the formal differences - although, at a glance, we could conclude that graffiti is more often textual, attached to tags or short messages, while street art is visually more elaborate and usually larger in format. Also, street artists more often have academic education, which makes their work closer to the "establishment". Taking this into consideration, we can say that the transformation of graffiti into street art is the result of a certain kind of institutionalization - street art is, after all, art with a permit; it is not only legal, but often commissioned; it is exhibited in museums, purchased, it enters the canon of contemporary art, and so on. In his text "Graffiti and Street Art: from Piece Making of Place-Making", Graeme Evans points out that we associate street art with "high art", but also the art market, while graffiti retain their status of urban pests. Many cities even have designated sites where artists are allowed to paint, which definitely robs "writing on buildings" of its original rebellious dimension; having an established space where you can work in this context certainly seems like quarantining and mitigating political messages. Evans goes one step further, calling the creation of commissioned pieces "artwashing" and linking it to the process of gentrification. Many other authors have expressed similar views and warned that the neighbourhoods that encourage this form of creative production become ripe for investment, get a new "image", and attract new types of customers and stakeholders. As Rafael Schacter writes in his article for The Conversation, street art may seem politically charged, but it is actually "perfectly non-partisan" because the artists are invited to mark a place (or a client) as "cool" and "bohemian" through their intervention. A good example is the headquarters of the European Central Bank in Frankfurt, which allowed painting on its fence during construction work - first to a group of students, and then to artists who wanted to express critical attitudes toward capitalism, international politics and the EU. The fence soon became a big attraction, and, even more ironically, several bankers and businessmen expressed the desire to buy pieces. Another interesting and symptomatic case is the exhibition Street Art: Banksy & Co: L'Arte allo Stato Urbano, which took place in the spring of 2016 in Bologna, and the reaction of the artist Blu to the exhibition’s concept. It was organized by Genus Bononiae, a department of Bologna’s largest bank Fondazione Carisbo, and the presented pieces (more precisely, the walls containing the pieces) were removed from their original locations and placed in the gallery space (allegedly in order to preserve and protect them). When asked by the press how one was to distinguish vandalism from street art, the organizers said that "everybody can figure out for themselves which is art and which a scrawl disfiguring the city." However, we should bear in mind that not only were some of these "works of art" considered vandalism at the time of their creation, but that Bologna is at the moment still actively battling graffiti by implementing a widely-acclaimed model of cooperation between the citizens and the city government, according to which the city is a "collaborative social ecosystem" in which citizens act by, among other things, removing graffiti. In order to express his dissent and prevent the relocation of his works, Blu painted over all the murals he had made in the past 20 years in Bologna, clearly underlining the irony of a city trying to present itself as the saviour of street art, while at the same time penalizing young people who are painting it and driving them out of the spaces where they operate. Of course, it’s almost needless to say the that the context of Miron Milić’s mural’s creation is quite different from the examples above; they can, however, shed light on some of the ambiguities concerning artistic activity in public spaces in the broad sense, but also raise questions of ownership, authorship and community. When called out for the removal of the walls containing murals for the exhibition in Bologna, the organizers defended themselves by saying that the artist is the author of the mural, but the building owner is the owner of the artwork on it (whether it was created with permission or without). This attitude certainly highlights issues of private property and the common good, questioning to what extent the public space truly is public. At the same time, we can see that street art is a specific form precisely because the artist is in some way alienated from their own work, or at least its material dimension. So, we are faced with a situation where the artist needs to get a permission for his or her intervention, but those who give the permission can do more or less anything they want with the intervention. The realization of Milic's mural required several permits to be finagled: from the tenants (51% of the owners of apartments), from the City Institute for the Conservation of Cultural and Natural Heritage and from the City Office for Physical Planning. Of course, obtaining the license is no guarantee of the intervention actually being accepted - just remember the sudden removal of Milić’s mural from the primary school in Umag: it was made following the instructions from the school’s principal, and in accordance with the school’s environmental ideals, but it was removed because it depicted three fingers, enumerating the terms "Reuse, reduce, recycle...". This incident, as well as the previously mentioned rainbow in front of the Bishops’ conference, shows that street art in Croatia still hasn’t lost its political power or become an agent of gentrification. However, we should make a passing note that the Design District Zagreb festival, in cooperation with which the mural in Vojnovićeva Street was made, can be classified as a process of gentrification and of attracting the creative class, given that, according to the organizers’ description, its "intention is to stimulate the construction of 'the Martićeva Street creative zone’, primarily through networking and cooperation of the participants of the existing local creative scene". But Milić's mural - considering its content on the one hand and the context of its creation on the other – should still be seen in a somewhat different light. As for content, the mural depicts several human figures and two dog figures in the street - the dogs are playing, a woman with shopping bags is returning from the store or market, a father is taking a child by the hand, a man and a woman are playing instruments... The characters shown are of different ages, genders, ethnicities, and so on. As the campaign organizer, the UPGRADE Platform, explains, "Miron Milić takes snapshots of the everyday life of this neighbourhood, indicating its challenges and skilfully connecting it all into a mosaic of this city’s life, where there is a place and a welcome for everyone." While it was being painted, the situation shown on the wall reflected the real situation on the street – people were hanging out, music was playing, dogs and kids were running around, and A Taste of Home was preparing food. So, in accordance to name of the campaign "Zagreb: Open City? ", it is about the idea of an open city and the role of artistic activities in its creation. With the aim of establishing a sociocultural centre in Zagreb, which would have a strong intercultural component, the UPGRADE Platform launched a campaign in which the openness of the city is examined and the future of the city envisioned through a series of media activities and cultural, artistic and social events. In his text "The Open City", Richard Sennet asks us to imagine what a clean, safe, efficient, dynamic, inspiring and just city would look like, adding that we need images to “critically confront our masters" with what needs to be done. Street art is one way of creating such images, since it is an integral part of the process of transformation, imagining and re-appropriating urban spaces. In addition, it is obvious that it encourages discussion among citizens about who has the right to the city and the management of public spaces. Sennet’s vision of an open city (as opposed to a closed system, characterized by equilibrium and integration) is organic and ecological: it is a system in which growth, seen as a continual struggle between balance and imbalance, allows conflict, diversity and discord. This somewhat utopian vision actually represents the spatialization of the idea of an open society that transcends divisions, rejects stereotypes, accepts and nurtures differences and establishes new forms of interaction between its participants (including the creation of a democratic space). Just like the public sphere is shaped by everyday interactions, conflicts and negotiations between different social groups, so is the perception of street art created socially. The viewers don’t establish an individual relationship toward interventions or pieces in public spaces the way they do in a museum; their meaning hinges on a number of factors (from the spatial and political to the visual), and is produced through relationships that permeate all the elements of the urban environment. Since cities function as physical, but also imaginary spaces that simultaneously reflect and construct social relations, street art - as a primarily visual element of the city – is itself a way of producing the public space, since it includes various participants, encourages discussion and shapes attitudes. Milić’s murals, though seemingly apolitical, often contain a haiku or a remark that is deeply rooted in everyday life (What luck / to cross this summer river / with sandals in hand! ; spiders in the corners / don’t worry / you won’t be swept; Grandfather knew a guy in Caritas who put the best things aside for us, etc. ), which allows passers-by to more easily identify with his message and accept it as an integral part of the city that, on a symbolic level, creates a link and encourages solidarity between all citizens. Therefore, some of the questions raised by the campaign - how to start a dialogue between residents and different cultures, how to create a sense of connection among strangers, how can creating a space generate new growth and how can the visible form call for engagement and identification - find their answer right there in Milić’s mural. Also, compared to his other murals that cover the entire façade (for example, in Petrinjska Street or in Vodnjan), this one, with figures scattered on the somewhat dilapidated façade, looks unfinished - but that is also appropriate, since the realization of the idea of an open city is itself a "work in progress".